Making a decision to open a Savings Account with ACLEDA Bank Lao, you will receive one of our attractive interest rates that you can deposit in Lao Kip, US Dollar, and Thai Baht. Interest on deposit is daily accrued and monthly capitalized. 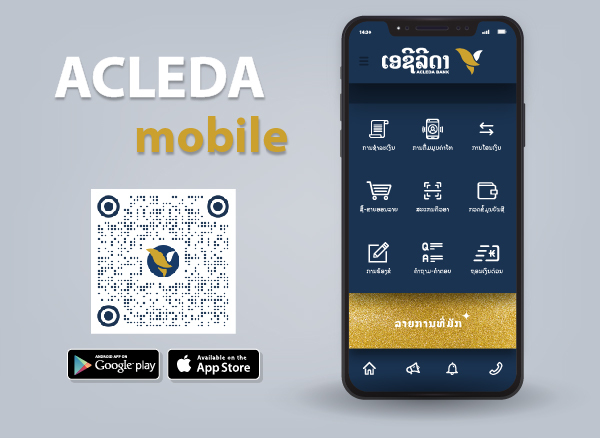 ACLEDA Bank Lao is a secure and reliable place to deposit your money with an attractive interest. Our service is delivered through online technology to ensure a convenient and efficient time for you. Initial deposit and minimum daily balance required only LAK50,000; USD5; or THB200. No service charged for account opening. Free passbook delivery. You can control the accuracy of your payment in every operation within the passbook. We also serve you with the most updated information technology. USD Not provide interest rate. THB Not provide interest rate. The rates are quoted for indication purpose only and subject to variation. Please contact our branch for confirmation.